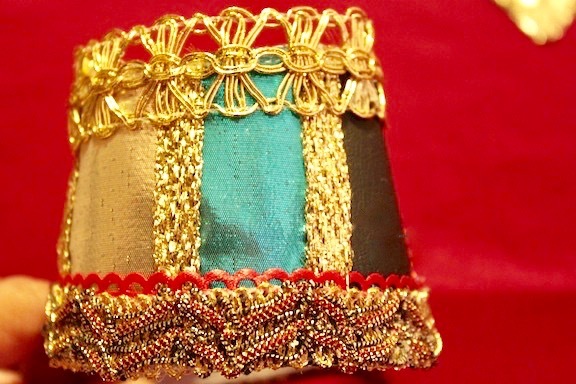 Vdeo on "Make Egyptian Jewelry" and the tutorial below. 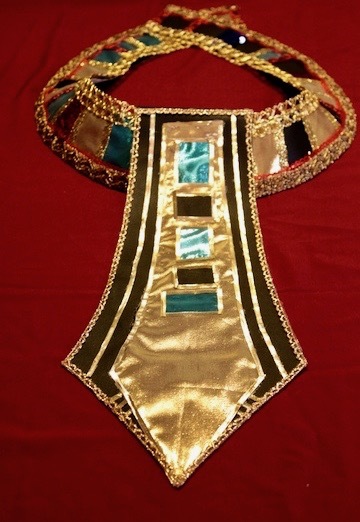 Also be sure to check out "Make Egyptian Costume"
This video and tutorial on how to "Make Egyptian Jewelry" will cover the traditional Egyptian pieces used In a costume. We cover the neck piece, cuff and belt with scrapes of fabric and materials from past projects. 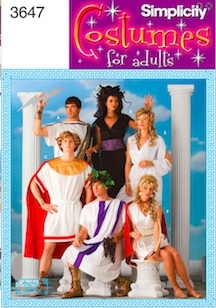 This was a fun crafty project that will be useful in costumes for years to come. For the base of the necklace, I used some left over Naugahyde. Any fabric with rigidity would be ideal, or add heavy interfacing to a lighter weight fabric. Or get creative and look around the house for a durable base. I used left over gold ribbon to surround most of the two upper rows of stones. Fabric or wrapping paper for jewels. To make the necklace, belt and cuffs, I used the Simplicity pattern pictured below. After finishing the necklace, I realized it was too large for a woman, so I cut the third row off and used it for the belt and cuffs. If you don't want to make the belt and cuffs, you can trim this necklace to your size. 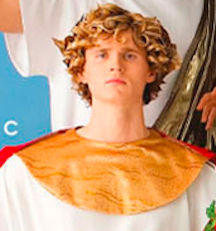 This same Simplicity pattern has a pattern that could work for making an Egyptian costume. This necklace is an important part of an Egyptian costume. I happened to have some naugahyde left-over from a project, but any fabric with some rigidity to it would work for the foundation of the necklace. 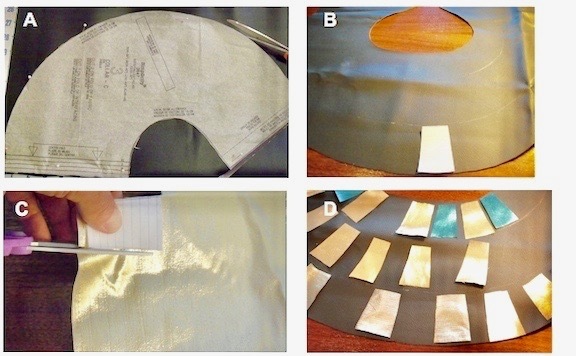 Pleather, or adding a heavy weight interfacing to a fabric would be a couple of possible options as well. I happened to have black, which worked because the Egyptian necklace had black in it, but even if the fabric is not the right color, you can completely cover it with trim, fabric, wrapping paper and ribbon, etc. A. Lay out the pattern or make a pattern and place it onto the fabric. Trace and cut, or just cut. Keep cuts smooth for a nice finish, although trims cover most anything. B. Measure each row and pencil it onto the fabric. C. Cut out templates of the fabric (to look like stones), and make many. 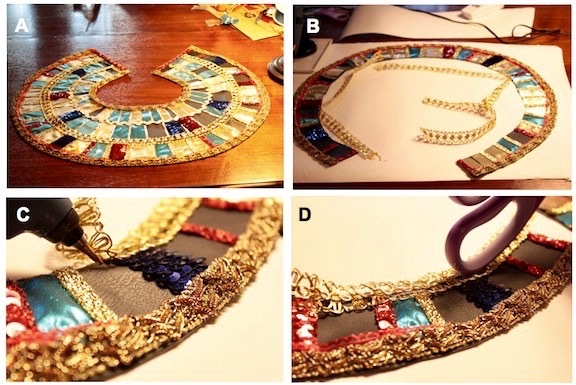 Turquoise, black, red, blue and lots of gold are the main colors in the actual Egyptian necklace. D. Lay out on the fabric. E. Then start gluing. This is a time consuming necklace, so be prepared, by starting in advance. Probably a couple of hours, 2 or 3 sittings. If cared for properly, this costume and necklace can be used for most any costume party all year round, for years to come. A & B Again from the necklace, the 3rd row was cut off and used for the belt and necklace. C Finish raw edges with trim of choice. D Press down on trim while glue is hot. Measure to wrist and add Velcro on one end only for a cone shape. This is the way women showed off their jewels. The 3rd row to the necklace above is what is used for the waist band part of the Egyptian belt. Once the 3rd row is cut away from the necklace, put it around the waist of the person wearing it, and cut in a place that would be hidden by or finished with trim. Then add Velcro where necessary to shape it like a cone. Beware of Velcro when not in use. Keep it properly attached to itself so it doesn't snag the belt or costume. It can tear things up fast, so right after taking it off close it and store properly for many uses. A Here I used the old costume belt as a template, but if you don't have one, just free hand it on a piece of paper until your satisfied, then trace it on the fabric. Add a couple inches to the top to use as a flap that will wrap over the top of the waistband part of the belt. B Add the gold. As you can see in this photo, the gold has been patched in from scraps, so I was careful to make the seams where they would be covered by trim or the stone. C Add the imitation stones shaped like squares and rectangles. D Trim all raw edges with whatever you like or have. 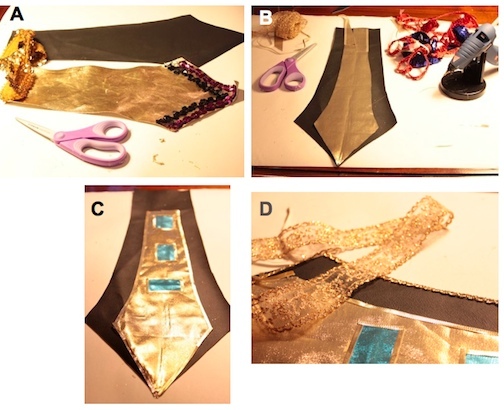 Be sure to check out "Make Egyptian Costume"